This morning Emma woke me up and after a shower we had breakfast in the kitchen. Emma had made some super vitamin drink for breakfast, which were fresh fruits mixed with yoghurt in a blender. But because Emma wasn�t sure it would keep me going for the rest of the day, she also made some scrambled eggs. It was time to pack again and get going to my next address in Vancouver and Emma was going to help me out. She called to her work to say she�d come a bit later and we walked (unfortunately through the rain) to Granville Island. �Granville� is a small peninsula on the Kitsilano side, which connects with downtown Vancouver with the huge Granville bridge. It is not only a big attraction for tourist, it also is a very cultural spot, with shops for artists, a theatre, kids play markets (paradise for kids) and a public market. The island was reclaimed from swampland in 1917 as an ironworks and shipbuilding centre, but by the 1960s the yards were derelict and the place had become a rat-infested dumping ground for the city�s rubbish. In 1972 the federal government agreed to finance a programme of residential, commercial and industrial redevelopment that retained the old false-fronted buildings, thin-shack homes, sea wall and rail sidings. The cruise was mesmerizing and it was as well very soothing to float on the water for 25 minutes. When I arrived on the shore of downtown Vancouver, it felt if I was purified. Or was that also a bit owed to the rain? 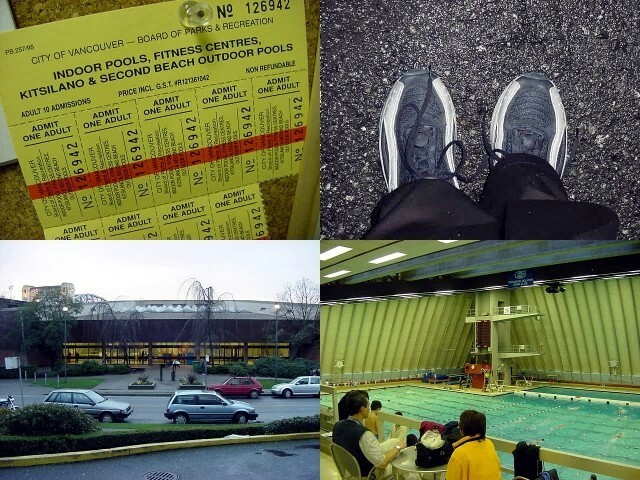 I had to get myself to Beach Avenue in the area named West End Vancouver (air shot), where my hostess Gail Edwin lives in a big apartment tower. It was only a few minutes walk when I found out that I was standing in front of it. �Ramon! Ramon!� By coincidence Gail was standing on the balcony and waving at me! She let me in the complex through the intercom and welcomed me on the floor where she has her little one-bedroom apartment. �It�s small and I even work here too,� she added. There is one room with a kitchen to the side and a bedroom and bathroom in the back. I would be happy with it too, because the best thing was the view. I could look out on the balcony and see a green garden below (including this fascinating blue swimming pool), but also the beach, Sunset Beach as it�s called. There must have been seen great sunsets from this balcony! Gail Edwin does independent economic research and works for forest products analysts. That sounded quite difficult and it might be so too. She collects data of all kinds of possible statistics, like lumber in connection with house prices, interest rates, currency exchanges, economic downfall, and etcetera, and puts it together in graphs. It is Thursday so for Gail just another working day. I dropped my stuff in her living room where the big soft red couch will be my bed and Gail helps to get my laptop connected to her Internet connection. I can use the time to work on my writing and updates and she can continue with her work in her office/bedroom. During a few of her breaks, after she had long phone calls with colleagues while she walked through the house with her headphone set on, we discussed the Olympic bid election for Saturday. Gail is very against the Olympic Winter Games of 2010 to be in Vancouver. 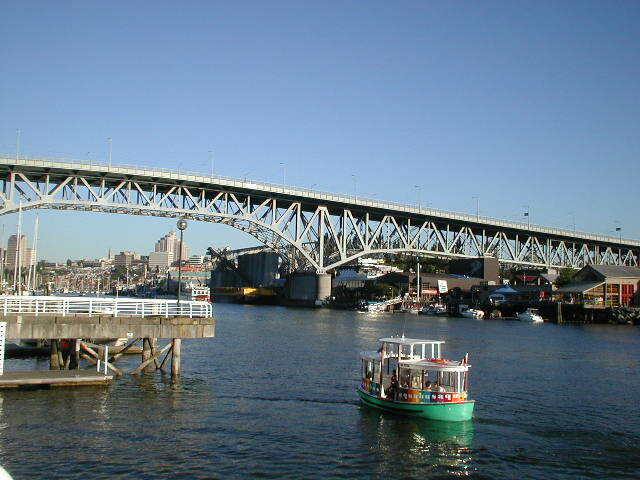 �We have two bridges from the city to North Vancouver. Then there is one road going all the way to Mount Whistler where she snow activities will be. How do you move so many people on these roads on such distance?� And I can remember the Winter Games in Calgary (when The Netherlands were doing great with Gold Medals) and she can�t understand why the organisation isn�t choosing for Calgary again, because �all the buildings from the previous Olympics are still there anyway!� Gail will be voting No on Saturday. We had a chicken sandwich for lunch and around 2pm Gail had to go to a work meeting in town for a couple of hours. But it was no problem for her that I stayed at her place. I could work on my website (I had some very big database problems and various scriptbugs I had to work on) and she gave me an extra set of keys of the apartment complex and told me I could use one of her free coupons to go to the [url=www.vancouverplus.ca/profile/374100]Vancouver Aquatic Centre which is on the other side of the street! I might end up swimming today anyway! Very happy with Gail�s hospitality and confidence in me as a stranger who she invited through a website, I changed into a more sportive outfit, grabbed a towel and headed to the swimming pool. Unfortunately loads of kids were getting swimming lessons, and the public swimming would only start at 8 at night. Bummer. But next to the Aquatic Centre starts the beach, so I had a short walk on the beach. The weather wasn�t really cooperating, because it started raining hard again the rest of the day. The fact is that Gail offered me to stay for a few days. She wouldn�t actually be too busy from Friday to Sunday and I could easily just crash at her place and explore the city the coming days. I love to stay at people�s places and enjoy the surroundings, so why not get pleasure from that pleasure for four full days? It was already dinner time when Gail returned and I spent quality time behind my laptop. The weather was miserable today, but it would get better in the coming days. For tonight�s dinner Gail took me out on to Davie Street and she let me choose between a Singaporean or a Japanese restaurant. When I saw the sign �sushi� I immediately choose the Japanese restaurant Samurai, as sushi has one of my favourite kind of meal. Gail told me about how nice sushi is in Canada and how it would really taste different than cheap sushi places around the world, so I was already watering. She also knew to tell me a lot (a lot!) about the restaurant in Vancouver. Every now and then she had to mention a good place or a good street of restaurant, that I honestly asked if she also cooks herself. �I don�t like to cook for myself, I rather cook for my friends, but you can�t do that every day. And, that is the advantage of living in the city centre; I am surrounded by good and very affordable restaurants, I should be treating myself to it. When I might end up in a dreary suburb, they won�t be there!" And there's a good point! 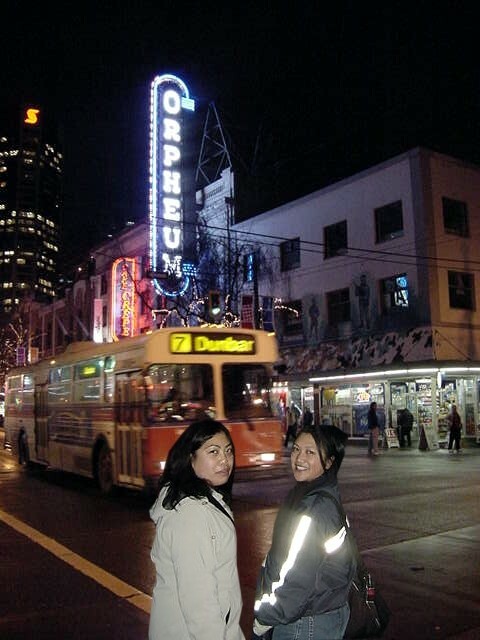 Vancouver Downtown and the West End is packed with restaurants (from small corner shops to high class restaurants) and with the tour she gave me after dinner through West End I was amazed by the multicultural food scents that hang around on the colourful nightlife streets. 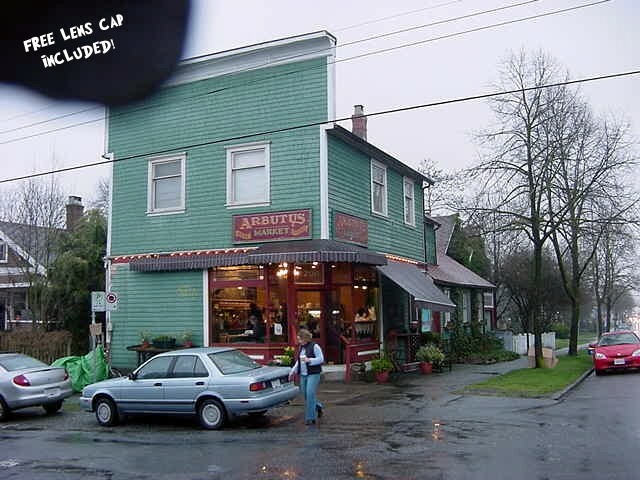 During this tour, Gail�s friend May joins us and we end up in Nelson�s Caf� near Granville Street, where two funky artists were playing live music on stage. 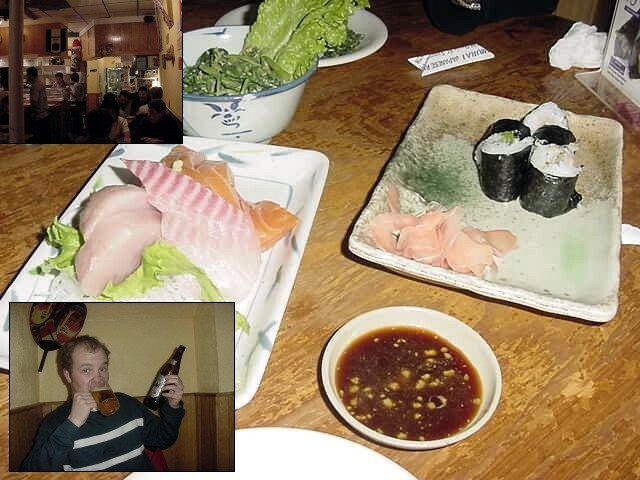 We had a few drinks (Gail let me try out different fruit cider drinks), until May drove us back home to Beach Avenue. May is an English teacher at the Vancouver English Centre and has two other jobs in the Vancouver movie industry (production stuff and writing) next to that. We had not guessed that our evening tour through West End would be so extensive, because we still had to buy groceries for tomorrow. And as this was Canada, and as it was past 1 o�clock at night, we went to the supermarket. It was my first time to visit a supermarket after midnight, such a thing does not exist in Europe for as far as I know. In my hometown the supermarket closes at 9pm and then the Nightstore is open until 1pm, but you don�t really want to go there because you pay four times double the normal price for late night shopping. Good night Vancouver West End!